Turbo Air Commercial Refrigeration is designed to keep your food products at the right temperatures while smoothly fitting into your existing kitchen workflow and saving you money at the same time. Turbo Air equipment is available in a variety of types and configurations, including both freezer and refrigerator models of standard upright reach-ins, worktops, undercounters, merchandisers, open display (air curtains) and refrigerated prep tables. 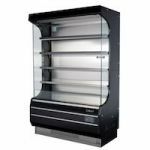 Turbo Air TGF-10SD-N 26" Black Super Deluxe One Section Glass Door Merchandiser Freezer - 7.92 Cu. Ft. Turbo Air TGF-10SD-N 26" White Super Deluxe One Section Glass Door Merchandiser Freezer - 7.92 Cu. Ft.